The collections take place between 6 a.m. and 8 p.m. Organic waste collection dates are indicated by a leaf ( ) icon in the calendar of the English Home page. Set out your bin by 6 a.m. on collection day, but no earlier than 5 p.m. the evening before. Place the bin by the road but not in it, as shown in the adjacent diagram. The bin must be placed in such a way as to enable the mechanical arm of the sanitation truck to lift it for emptying. Remove the empty bin from the roadside within 12 hours of the collection. Because the collection is fully mechanised, any waste placed next to the bin (such as paper bags containing leaves) will not be collected. The 240-litre brown rolling bin is provided by the Municipality. The bin belongs to the Municipality of Austin; when the property is sold, it must remain with the house. New house: The Municipality provides one bin per residence for the collection of organic waste, free of charge. Please complete the online Bin Request form; the bin will be delivered to your home in the following week. Stolen bin: The Municipality replaces a stolen bin upon presentation of a police report. Report all damages (wheels, cover or grid) to the Municipality by completing the Bin Request form. An employee will come by to repair it on the next collection day, after the bin has been emptied. Please note that only bins provided by the Municipality are repaired. The property owner is responsible for the cost of repairing or replacing a bin belonging to the Municipality, unless the damages have been caused by mishandling by the sanitation crew. Consult the list of the types of waste accepted/refused (in French) at the composting platform of the Régie intermunicipale de gestion des matières résiduelles de Brome-Missisquoi (RIGMRBM), where we send our organic waste. Deposit organic waste pell-mell into the bin. To gather them, use only paper bags. Liners made of newspaper (flyers work too!). Watch this short video to find out how to make one for your kitchen compost bin. It’s easy and economical! Compostable plastic bags are no longer accepted in the brown bin. The use of plastic bags, compostable bags or oxo-biodegradable bags is prohibited. The MRC of Memphremagog’s pamphlet The Brown Bin; Problems and Solutions provides practical tips to make your composting experience easier. Recyclables are collected every two weeks on Monday. The collections take place between 6 a.m. and 8 p.m. Recyclables collection dates are indicated by a recycling ( ) icon in the calendar of the English Home page. Set out your bin by 6 a.m. on collection day, but no earlier than 5 p.m. the evening before. 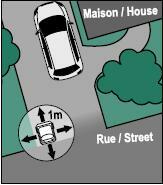 Place the bin by the road but not in it, as shown in the adjacent diagram. The bin must be placed in such a way as to enable the mechanical arm of the sanitation truck to lift it for emptying. Remove the empty bin from the roadside within 12 hours of the collection. Because the collection is fully mechanised, any waste placed next to the bin (such as oversized cardboard boxes) will not be collected. The 360-litre blue rolling bin is provided by the Municipality. The bin belongs to the Municipality; when the property is sold, it must remain with the house. New house:The Municipality provides one bin per residence for the collection of recyclables, free of charge. Please complete the online Bin Request form; the bin will be delivered to your home in the following week. Stolen bin: The Municipality replaces a stolen bin upon presentation of a police report. Report all damages (wheels, cover, axle) to the Municipality by completing the Bin Request form. An employee will come by to repair it on the next collection day, after the bin has been emptied. Please note that only bins provided by the Municipality are repaired. The property owner is responsible for the cost of repairing or replacing a bin belonging to the Municipality, unless the damages have been caused by mishandling by the sanitation crew. Aluminum plates and paper, cans, food tins, etc. Rinse before placing in the blue bin (labels may be left on). Shopping bags, milk and bread bags, etc. Gather all bags and clean wrappings in one bag and tie up. Juice bottles, shampoo bottles, household product containers, etc. Rinse plastic containers and replace the cap. Wine bottles, oil bottles, jam jars, etc. Rinse the bottles and jars before placing in the blue bin (labels may be left on). Containers for milk, juice, broth (e.g. : Tetra Pak containers). Cardboard boxes, paper tubes, paper towels, paper sheets and envelopes, magazines, newspapers, etc. The use of plastic garbage bags in the recycling bin is prohibited. 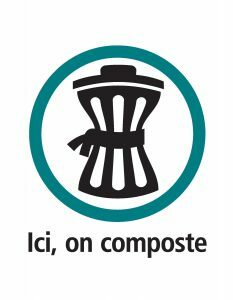 For more information on sorting your recyclables, visit RécupEstrie.com (website in French only) or consult the Municipality’s Good Riddance! Guide. Household waste is collected every four weeks on Monday. Collections take place between 6 a.m. and 8 p.m. Household waste collection dates are indicated by a trash can ( ) icon in the calendar of the English Home page. Set out your bin by 6 a.m. on collection day, but no earlier than 5 p.m. the evening before. Place the bin by the road but not in it, as shown in the adjacent diagram. The bin must be placed in such a way as to enable the mechanical arm of the sanitation truck to lift it for emptying. Remove the empty bin from the roadside within 12 hours of the collection. Because the collection is fully mechanised, any waste placed next to the bin (such as extra garbage bags or oversized items) will not be collected. Only one container per household is authorised. PROHIBITED WASTE: Manure, sludge, construction and demolition waste, explosives, dead animals, tires, scrap vehicles and vehicle parts, oil-soaked soil or sand, mining residue, biomedical waste, radioactive waste, hazardous waste and fire debris. Waste produced in commercial or industrial quantities is also prohibited. To reduce the amount of waste sent to the landfill and promote the salvaging of reusable and recyclable items, the Municipality of Austin provides its citizens with free access*to the Magog Ecocentre. Citizens are responsible for transporting their items to the Ecocentre and must pay the applicable fees charged for certain types of waste. * Access is free but the Municipality pays an annual fee of $20+ per registered residence to the City of Magog. For this reason, citizens are asked to register or renew only when they intend to use the service. Register at the Austin Municipal Office.You must bring a valid ID and a proof of residence. On your first visit to the Ecocentre, an attendant will give you a numbered card. This card must be presented at each visit. The card is valid until December 31st of the year in which it has been issued. Renewal: The card may be renewed in person at the Austin Municipal Office, by phone (819 843-2388) or by e-mail. 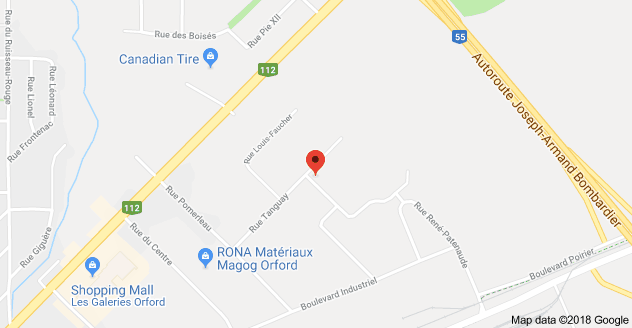 2300 Tanguay (in the Magog industrial park) 819-847-0835 environnement@ville.magog.qc.ca For information on opening hours, types of waste accepted and applicable fees, please consult the information sheet published by the Magog Ecocentre (in French only). The Ressourcerie des Frontières is an on-call, year-round collection and transportation service for discarded oversized items (furniture, appliances) and other household objects. Items are accepted regardless of their state or condition and whether they are functional or not. The recovered objects are processed by prioritizing, in order : reusing, recycling and recovering. The Ressourcerie gives a second life to nearly 95% of the items it picks up! This customized service is provided to Austin citizens free of charge. Provide a description of the items you will be discarding. Be as accurate as possible as it enables the Ressourcerie to plan the available truck space. Wait for the confirmation call. The Ressourcerie will pick up your items within 3 weeks. The pick-up date will be confirmed within 24 to 48 hours before. Gather small objects into boxes. Place the items outside, where they may be easily accessed. For insurance reasons, the movers are not authorised to enter your residence, unless a prior agreement has been reached with the Ressourcerie. Ensure that the items are placed in a sheltered area, or cover them up with a tarp. If possible, avoid putting your items by the roadside before collection day. You do not need to be at home on the day of the pick-up. The items listed below are accepted regardless of their state or condition and whether they are functional or not. Only unsanitary objects will be refused. Large and small appliances: refrigerator, food processor, etc. Electronics and computer equipment: television, computer, cell phone, satellite dish, etc. Various appliances: air conditioner, water heater, etc. Patio and garden items: barbeque, swing set (dismantled), etc. Household, leisure, and workshop items: dishes, glassware, knick-knacks, lamps and fixtures, mirors, games, toys, books, CDs, tools, etc. Toilets, sinks, bathtubs, showers, etc. Reusable construction and renovation items: unused tiles, new plywood sheets, feuilles de contre-plaqué neuves, unused planks, etc. Windows (excluding thermal), sheets of glass, doors, gutters, etc. Car items : alternator, battery, motor, etc. Hazardous household waste: oils, paints, pesticides, batteries, compact fluorescent lamps, neons, propane tanks, extinguishers, etc. Food scraps and other organic waste such as leaves, grass, branches, etc. Aggregates: rocks, concrete, sand, asphalt, flagstones, etc. Waste from building demolition: wood with nails, old linoleum, used vinyl siding, etc. Very heavy or very large items such as trailers, pianos, sailboats, manure spreaders, etc. Propane tanks, used oils and paints are no longer accepted at Town Hall. These types of waste must be taken to the Magog Ecocentre (citizens must obtain their free access card at Town Hall). Christmas lights: Standard strings of lights (bulbs and wire). Other types of lighted decorations are not accepted. The Municipality participates in Recupex’s annual used clothing drive « L’Estrie met ses culottes ». The collection usually takes place in early May at Town Hall. The exact dates are published in the calendar. In early January, the Municipality collects natural Christmas trees placed by the roadside to ensure that they are disposed of ecologically. The exact dates are published in the calendar. All the ornaments must be removed from the trees. Farms and businesses must contact the Municipality to register for waste collection services. They are required to dispose of their waste ecologically, in accordance with provincial and municipal laws and by-laws. Small businesses may use either rolling bins or containers, depending on the volume of waste generated. Collection services are offered year-round or on a monthly basis for seasonal businesses. Businesses and farms also have access to the Magog Ecocentre, Ressourcerie des Frontières and Town Hall drop-off point (see tabs above) to dispose of waste that is not accepted in the municipal collections. Please contact Environmental Services to find out the different services and options available for businesses and to register. The Municipality provides a container to farms using bales, to ensure that the plastics used to wrap them are recycled. The farm plastics are collected twice a year. This service is free of charge. Farm plastics placed in the container must be relatively free of dirt and mud. For more information or to get a container, please contact Environmental Services. A receipt is left to inform the property owner that the service has been delivered.